This topic contains 1 reply, has 2 voices, and was last updated by Capricorn 3 months, 2 weeks ago. Nationalists who identify with Serbia were marching in Bosnia-Herzegovina yesterday to honor the genocide of Muslims during their attempt to create their own Serbian state in 1992-1995. 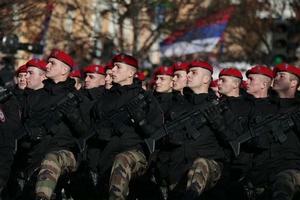 They did manage to gain recognition for an autonomous region of Bosnia-Herzegovina which they call Republika Srpska and they paraded in its principal city of Banja Luka. For these Bosnian Serbs, war criminals Radovan Karadzic and Ratko Mladic are honored heroes. It is saddening that the poison of nationalism lingers in pockets of Europe which has suffered so much cruelty under its influence such a short time ago. These young men were not born when their parents were rounding up boys and men for summary execution because they were Muslims. Without question, given the right conditions, these fellows would be willing to do the very same.